Coastal/Holz Racing’s No. 1934 RZR XP 1000 would start in fifteenth with Scott Kiger and co-driver Tyler king starting the race. By Pit 6, where they’d have a driver change, Kiger had moved up to the top five giving Mark Holz and co-driver Rob Utendorfer great position to finish the race strong. Leading the race the whole day would be Brandon Schueler in his brand new No. 1919 Jagged X RZR XP 1000. Holz would continue to maneuver through the course getting the No. 1934 into third place by Pit 8. By Pit 13, Schueler would be 15 miles ahead of Holz with the No. 1934 driving hard. With Reno 30 miles away, Holz would cut the gap to five miles and cross the line physically behind the No. 1919 but with corrected time, Coastal/Holz would take the win by 55 seconds. On the ATV side, the Team UXC/Driven Powersports/Polaris Factory Racing’s No. 440 Scrambler XP 1000 would start in third place in the Quad Expert Class. Michael Swift would start the race and maneuver the Scrambler XP 1000 to second place by Pit 3. Teammate Chris Robinson would take over at Pit 4 with plans to carry the No. 440 to Pit 8 but an unfortunate left rear flat by pit 7 set the team back to third place. 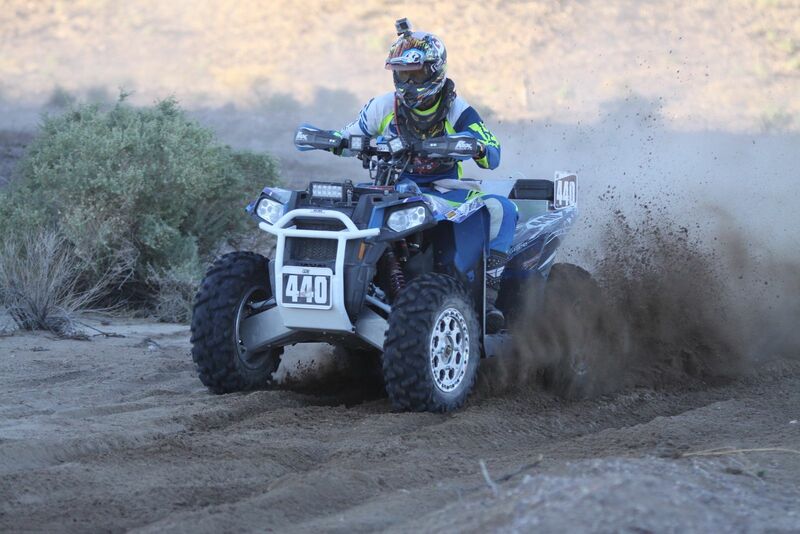 Swift would climb back aboard and, at Pit 12, Driven Powersport’s Don Higbee would jump on and tackle some of the most difficult sections of the course. Just 20 miles outside Pit 14, Higbee encountered a problem with a rear tire which the chase team fixed at Pit 14. Swift would jump back on and ride to a second place finish putting the team in the points lead for the class in the series. The next Best in the Desert race is the Bluewater Desert Challenge, Oct. 8-10, in Parker, Ariz.
Jagged X is sponsored by Polaris, Walker Evans Shocks, Polaris Lubricants, CR Designs, Simpson Safety, OMF Performance, Muzzy’s, Factory UTV, Tire Blocks, Varta Powersports, Vision X lighting, Mountain States Contracting, and UTV Underground.